I just can't get enough of make ups and shoes lately. I believe i have already bought tons of make up products ever since i came back from Hong Kong after the new year this year. Oh dahhhhh... I am just obsess with make ups now. 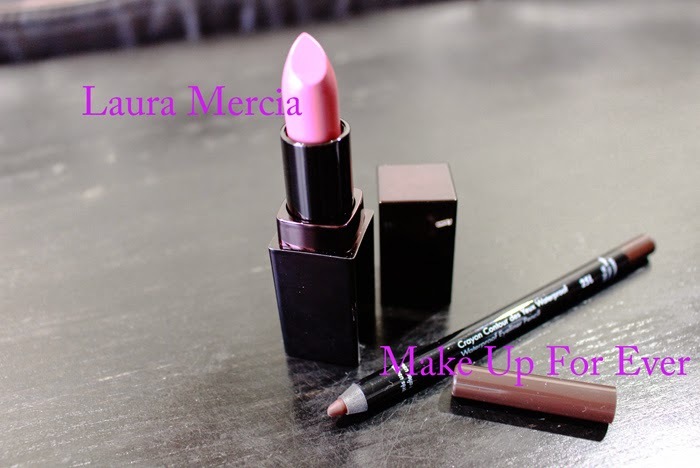 I bought a new lip stick (just after 2 days of purchasing Revlon's Butter Lip Balm) from Laura Mercia. Totally obsess with this color! It gives such a smooth texture. This has become my every day make up routine. It is pink but it has a purple undertone. Retails for $38 if i am not wrong. And of course, a brown eyeliner from Make Up For Ever. This is included in my everyday make up routine as well. Make Up For Ever probably has the best eyeliner formula compared to other brands that i've tried. But if anyone has better recommendations, feel free to tell me because i'm open for alternatives. haha. I guess i'm lacking some rings on my fingers. haha. It was my 21st birthday yesterday and i had a great time spent with my boyfriend. This year, i chose to have a really chill and quiet celebration just with my love one. I am not sure but perhaps i am really getting 'older' in my mind. Aren't people like me suppose to be a blast in clubs? Guess that's a pass for me and now i'm too lazy to even hang out at night! I enjoyed a gold class movie with my bf, watching 300 rise of the empire, with my usual French Earl Grey. Nice movie. Recommend to watch! Next movie should be Need for Speed or the new movie related to this Lobby Boy. Alright, i'm ending my post here! Thanks for reading!